The US GMC CCKW 750 Gallon Tanker was the tanker produced in the largest numbers for the US Military during World War Two. 4,133 750 gallon tankers were produced during World War Two by the Yellow Truck and Coach Manufacturing Co initially and later GMC Truck and Coach Division. The majority of these vehicles were produced in 1944, when 2,282 trucks were produced. A model of the US GMC CCKW 750 Gallon Tanker has been released by Hobby Boss in 1/35th scale, it should however be pointed out that this model is suited to US Army use rather than US Army Air Force use which according to my reference had a slightly different design. A look through the box contents indicates that the packaging has done a good job of keeping all of the contents in good order and prevented any obvious damage or distortions. After opening the plastic bags a check of the parts resulted in a positive impression, I did not find any moulding faults such as flash. The only issue I found that may need addressing are ejector pin marks. The parts on the sprues are well laid out, with easy access for removal and small gates between the parts and the sprues. One other aspect I particularly like is that the parts are laid out in an order that reduces the amount of hunting needed to locate parts for each stage of construction. There is a full engine supplied with this model and while not a perfect match with my reference material, it is fairly close and has all of the main structures present. For those that like to improve their models, the engine can be improved via the addition of some wires to replicate fuel lines, general wiring and cables. The exhaust of the model takes the correct route through the model and will only need the indent in the outlet needing some work to further improve it. The radiator and rear shroud have also been nicely replicated and should add a nice finishing touch to this area. The chassis of this model is a multipart affair that does mean care will need to be taken to insure it remains square. By supplying this area of the model as a multipart affair it has allowed Hobby Boss to make a very realistic offering which is a great match for my reference. The chassis is provided with the option of building a model with or without a winch in place. The sprung suspension on the model is fairly basic as parts go, but the moulded detail is surprisingly good with good securing loop detail present. The drive shafts all look to be accurate when compared to my reference, placement is also good with the exception of the angle that one of the drive shafts leaves the transmission for the rear axles. The axles have a surprising number of parts which build into very nicely detailed sub-assemblies; these units which will likely rarely be seen will help to lift the detail to a high level on the underside of the model. One downside of this area is that the front wheels are not designed in a way that allows them to be shown in any direction than driving in a straight line and it looks as if it will take a lot of effort to correctly depict them in a turned position. The wheels supplied with the model have an accurate tyre tread pattern for the period and match my reference very well. They tyres are injection moulded offerings, which I know will please many who are adverse to vinyl rubber offerings. There will be a joint around the circumference of the tyres, but this should be easily remedied especially if heavy wear is going to be imparted. The wheels themselves have an accurate pattern both front and rear and have reasonable bolt detail. The only questionable detail I can find here is the centre hub on the front wheels which my reference indicate should be raised to the same degree as they are on the rear wheels. The cab supplied with the model is the model 1574 closed cab. The interior is by and large accurate to a high degree when compared to images online, but it does not match any of the reference in the book I have used for checking other aspects of this model. Because of this I do not know if the reference used by Hobby Boss for this model is accurate or based on a remodelled interior during a vehicle restoration. Either way it does look to have a complete look about it. The pinnacle lights for the dials are replicated but could be better represented or should that be defined. The door interiors are also very nicely detailed and include separate handle detail. All exterior features of the cab look to be again a very good match for my reference in just about every respect, but bare in mind that the model is not assembled. The only obvious fault I can find is the mounting point for the wing mirror arms, the mounting plate should be closer to the door frame according to my reference. The grill brush guard is very good for injection moulded plastic and highlights the advancements made in production methods. The two fuel tanks on the model look to be extremely accurate, the elliptical shape has been well captured and I can find only one fault with them. The access hatch on the top of each tanks have all the relevant external details very accurately detailed, the underside of the hatch does not have the rib detail and plug detail present, but this could easily be replicated if so desired. The only missing external detail missing is the oval surround on the tank around the hatch opening, this detail is easily added with plasticard. This is the only part of the model that my reference failed me as there are no schematics of this area. I have checked the parts against period photographs and where possible the details look to match very well, but I cannot vouch for the whole frame. The storage bins at the rear on both sides of the frame match the details in my reference, but I am disappointed that the content of these bins has not been included with the model. The jerry can container racks down each side of the vehicle appear to match photographic reference very well. The jerry cans supplied in the kit for the model are acceptable, but in these days when photo etched seams have become the norm, their absence may upset some. It should be noted that there are 14 jerry cans supplied with the kit, which is 10 short of a full load and so the spares bin may take a knock. The spare wheel supplied with the model is as previously mentioned very well detailed. The support securing bracket is also accurately placed and detailed. The instructions provided are nicely laid out in booklet form. The stages only consist of 14 steps according to the instructions, but the various sub assemblies all listed as a single step take this number up to 76 steps in my opinion. That said it is well laid out and not overly busy, as such this guide should be easily followed. The decals unfortunately do not live up to the effort put into the model itself. The American star supplied for each door are too large, but are I believe the correct size for the star that should be on the roof and which is not depicted or supplied. There should be a 25inch star on each door, placed on the lower portion of it. The front bumper should have the unit details separated in the centre by a 6inch star. The mudguard on the left hand side as you look at the vehicle should have a 15inch star in place. The rear of the fuel tank should have a 10inch star slightly high centre and below that should be the unit details. The rear bumper pads should also have unit details. The decals supplied for the tank vanes are applicable to the model. This model of the US GMC CCKW 750 Gallon Tanker by Hobby Boss may not be the most desired version of the truck, but it is a very nicely detailed model. I can see it in a diorama refuelling a Sherman tank or similar with very little work. It is a shame that Hobby Boss did not go that extra mile and provide the equipment inside the storage bins at the rear of the truck, but with a little effort and a raid on the spares bin it should make it feasible to replicate the needed detail. All in all a very detailed and competent model from Hobby Boss. One aspect of these trucks not replicated on the model is that they were often disguised due to the explosive nature of their cargo. The tankers often had the tarpaulin bows installed and a canvas in place to help prevent them being picked out of the crowd, this does provide the modeller of increasing the uniqueness of their build. For the purposes of this review I used the Tankograd Publishing offering ‘U.S. WW II GMC Wrecker Trucks, Gasoline Tank Trucks and AFKWX-353 COE’ truck. This publication provides a good reference to further enhance this model at a reasonable price. I also used images from various GMC CCKW forum websites for areas that the book did not cover. Highs: there is a very good level of detail and accuracy on this model. Lows: The decals are a let down on an otherwise great model. Verdict: Well worth picking up as you never know when it will come in handy. That Makes a Three Kit Mashup! I have somewhere the Studebaker closed cab, which 'might' be a donor? AND an old Airmodel VAC of the Studebaker cab.... Any Studebaker experts know if it carried the Tanker(s) Water or Petrol? I haven't found any "official" water tanker version, but here are three fuel truck variants : US6 model U5 750 US gal (2,800 l) tanker truck : In Soviet service BZ-35S : H.P. Well up till now I have been using the new Tamiya chassis and fender combo and just adding the Italeri cab but yes, the process I am talking about might require parts from all three manufactures which is why I mentioned the depth and size of my Deuce spares box! However the Italeri fenders and bonnet are all perfectly usible for this conversion (so only a two kit mashup) but require some modifications, as in cutting out the partial engine oil pan to allow the use of the very nice full HB engine. Has anyone compared HB's CCKW w/ Bofors open cab to other kits? I can't remember any negative comments there, so that might be usable once it comes out? I think the Bofors suffers the same problems but since it is an open cab and the model itself is so long and low the problem isn't as noticeable. I would suggest you instead use the Tamiya fenders, hood and cab for the HB Bofors version to correct this model. It should be a near drop-in substitution/change-out. F.Y.I. Just to be clear, the old Italeri tank truck is for potable water transport whereas the new Hobby Boss offering portrays the 750 gallon fuel tanker truck. 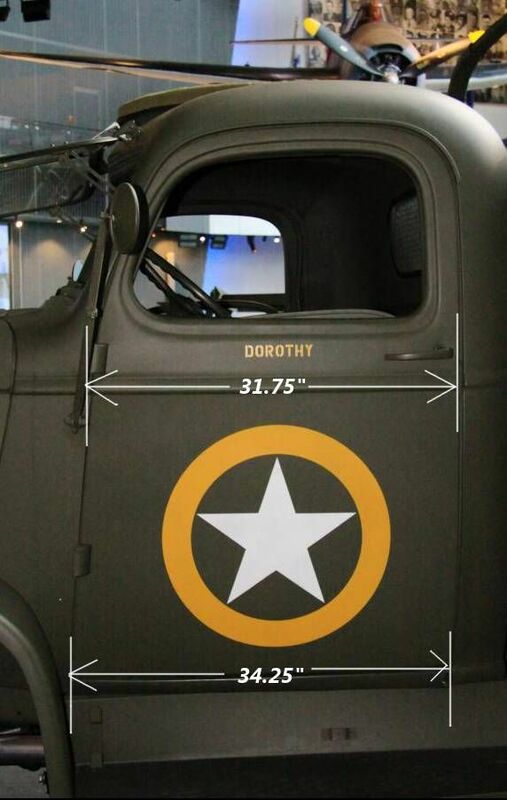 Both WWII US trucks existed in reality but were used for entirely different purposes.